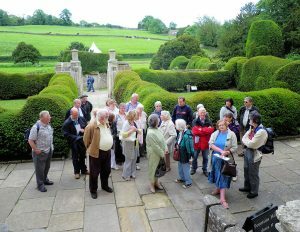 On Saturday 26th June, twenty-eight members and guests spending an enjoyable day visiting Fountains Abbey and the nearby town of Ripon. The Abbey is a ruined Cistercian monastery, founded in 1132 and is one of the largest and best preserved Cistercian houses in England, being a Grade I listed building and owned by the National Trust. Along with the adjacent Studley Royal Water Garden, it is a UNESCO World Heritage Site. Construction of the Abbey began in 1132 and it operated for over 400 years, until 1539, when Henry VIII ordered the Dissolution of the Monasteries. The Abbey buildings and over 500 acres (2 km²) of land were then sold by the Crown, on 1st October 1540, to Sir Richard Gresham, the London merchant, father of the founder of the Royal Exchange, Sir Thomas Gresham. 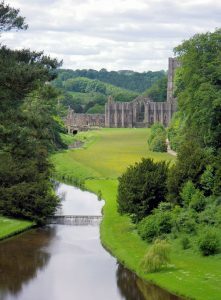 Fountains Abbey is maintained by English Heritage and owned by the National Trust. On the site are two other National Trust properties, Studley Royal Park and Fountains Hall, to which there is partial public access. The water garden at Studley Royal is one of the best surviving examples of a Georgian water garden in England, being created by John Aislabie in 1718. The Porter’s Lodge, formerly the gatehouse entrance for the Abbey property, features a modern exhibit area with displays about the history of Fountains Abbey and the monks’ lives. Those visitors who made the climb got an excellent view of the Abbey and water gardens from the elevated ‘Anne Boleyn’s Seat’. After spending some four hours at the Abbey, the party spent time in Ripon visiting the Cathedral and viewing the old Market Square. Thanks go to our Chairman Ian Whyte and his wife Kathy for organising the trip and to our coach driver on the day, Alan Weaver of Rossendale Travel Ltd. in Haslingden. Further details about Fountains Abbey, including visitor information, can be found at www.fountainsabbey.org.uk.